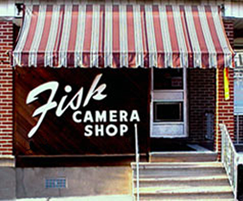 Since it first opened in the 1920's, Fisk Camera Shop has been a family owned and operated business. Current owner/operator, William H. Fisk IV is the third generation to manage the shop. "Billy" maintains the tradition of reliable customer service that was started by his grandfather more than 75 years ago. Back then, the shop was a small studio, and the Kodak Brownie was all the rage. Photography has changed a lot over the years. You will find that Fisk Camera Shop is dedicated to bringing our customers the latest trends and technology available. Thank you for visiting our web site. We hope you will soon visit our store.